Dame Hannah Rogers Trust provides education, therapy, care and respite for children, young people and adults with profound physical disabilities and associated learning difficulties. From 2010 the Trust will continue to expand their innovative and transformative work at their new Seale-Hayne campus. The Newton Abbot Orchestra are honoured to have formed a strong relationship with the Dame Hannah Rogers Trust since their move to the Newton Abbot area, and look forward to performing many more concerts in the Great Hall at Seale-Hayne. 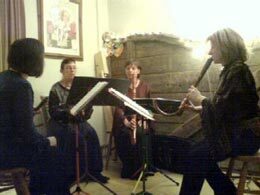 The Courtenay Players Recorder Consort was formed in 1989. At different times since then the group has consisted of combinations of players from two to five recorders, and has taken part in a wide variety of concerts through the UK. They play a wide range of instruments from the tiny garklien down to the contra bass and music not only of the Renaissance and baroque (the instrument’s traditional territory) but also the expanding contemporary repertoire. They also have a keen interest in education, and visit local schools, both primary and secondary, giving illustrated talks about the recorder and its possibilities, in the hope of dispelling its image as merely a stepping stone to the orchestra. 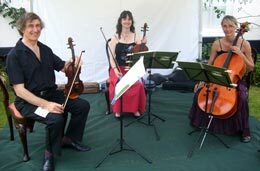 A popular feature at many of the Newton Abbot Orchestra's concerts is a contribution from the Amanti String Trio. Part of the Amanti Ensemble, the Trio includes the orchestra's leader, Adrian Janssen, principal second violinist Mary McLaren and principal cellist Janna Bulmer. Originally perceived as an ensemble combining string quartet and soprano voice, the Amanti have performed at many well-received concerts in the Southwest, specialising in their own arrangements of operatic arias and songs. To this, they soon added a wedding and function side, meeting popular demand for such a flexible approach. They have played at a great variety of events, from a Viennese ball to a Teddy Bear Signing Day and Village Fete. More regular appearances are at weddings, birthday parties and corporate dinners.